Since my last submission, we have nearly completed our Summer Full Bore season having enjoyed some pretty reasonable weather conditions at Bisley which makes open range shooting far more tolerable given some of the early starts! In greater detail – on 9 April the Vets. entered one team in the first round of the 2017 L&M League at Bisley. With a score of 448.19 we finished in 2nd place to Parthians Apart from the day’s shooting activity, some light relief – even a touch of merry schadenfreude? – was enjoyed on the point with three of our stalwart senior members, namely Jack Furtado OW (1951-56), John Horlock OW (1944-52) and Ian Todd OW (1947-54) corporately struggling to regain the standing position after shooting their targets! Indeed, a painful triumph of will over the (audible) protests of ‘mature’ tendons, joints and anything else that felt like adding some burn and pain to the occasion! Well done gentlemen, you got there! Some two weeks later we were back in action again…. On 30 April the Vets. entered two teams in the L&M Schools Veterans Match over 300 & 600 yards. First shot in 1978 having been instigated – and the winner’s trophy provided – by the WVRC. The winners were Old Epsomians – sound familiar? – with a record breaking score of 399.58, our ‘A’ Team finishing in an excellent 2nd place with 389.39. Our leading scorers were John Twyford OW (1956-64) with an impressive aggregate score of 98.9 and Guy Hart OW (2000-07) with a brilliant 50.9 at 600 yards. Conditions were not too bad with a light wind, although a little chilly. On 14 May we shot the 2nd round of the L&M League, over the familiar 300 & 600 yards. After a worrying start to the day with heavy rain, the heavens cleared giving over to bright sun with just a light wind. We finished in our now usual 2nd place within the division, beaten again by Parthians, but on this occasion ahead of Old Haberdashers and East Barnet. A notable feature of this round was David Westnedge’s OW (1953-59) best ever shoot to date at both distances. 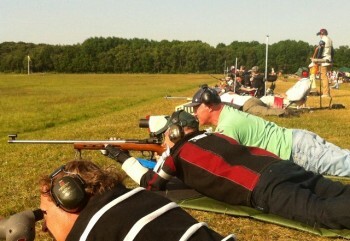 The third and final round of the L&M took place on 4 June, over 900 & 1000 yards. In our Division we finished in 1st place with 408.16: Bob Jackson was our leading scorer on 86.06. On this round we forced Parthians into 2nd place. Finishing this round in 1st place put the Vets.in a very creditable 2nd position on aggregate, the same as in 2016 with the added bonus of a perfect sunny day. Scores and results as above have been obtained from the London & Middlesex official web site. All credit and thanks to those members who have so far this year represented the Vets. so well in the Full Bore events, having also made some early morning starts to several of these Bisley matches. These stoic souls comprise Jack Furtado, Max Gennari, Nick Harman, Guy Hart, Bob Jackson, Paul Nalson, Ian Todd, John Twyford and David Westnedge… apologies if I have forgotten anyone! Thanks of course go to Graham Clark, as usual, for his organisational skills for the Vets. together with many thanks to Bob Jackson for his invaluable coaching services. Our final Bisley competition of the season is the National Rifle Association SV, to be held on the afternoon of Thursday 13 July with one shoot at 500 yards, for which we hope to enter 3 teams of 5. This event will be followed by the annual informal dinner at the Artists Rifles club house bringing our annual FB competition calendar to the usual convivial conclusion. The Whitgift School Rifle Club maintains its momentum under the excellent leadership of staff members Peter Morrison and Tom Stead, with assistance from the Vets. and Henry Parritt OW (2009-16). At this time of year however, exams etc. are affecting some of the weekly afternoon shoots for the obvious reasons. With regards to Small Bore shooting, not a particularly successful Winter League so I shall not dwell, but can but hope for better results in the 2017 Summer League. Like all clubs and societies, the Vets’ longevity [121 years] and continuance relies on a loyal and supportive membership and it is good to report that overall an influx of new members over the past couple of years hopefully bodes well for the future. I should like to remind readers that the Vets. is open to all OWs, plus former and current – full or part time – members of the Teaching, CCF and WA staff, including family members thereof. Veterans’ Small Bore shooting takes place every Tuesday evening throughout the year at the school range [19.00 – 21.00 app.] and on Thursday evenings if numbers warrant. Given the above, if any of you have a yearn to follow up a chance to re-discover old shooting abilities, or indeed give it a try for the first time, please contact Mark Collins OW (1979-86) at secretary@wvrc.org.uk or have a look at the WVRC entry in the WA website under Affiliated Societies. All equipment is provided along with coaching and advice! !